Friday 12:00 p.m. – 11:00 p.m. Artist market closes at 7 pm on Friday & Saturday. Spring is in the air and that can only mean one thing in Atlanta: the Atlanta Dogwood Festival is back! The Dogwoods are in full bloom, and hundreds of artists from around the country will set up their tents for the 83rd Annual Atlanta Dogwood Festival. An Atlanta staple for more than 80 years, there is something for everyone at the Atlanta Dogwood Festival. Virtually every kind of art imaginable is represented at the festival, with a nationally renowned-juried Fine Artist Market that includes sculpture, paintings, pottery, jewelry, photography and much more. In addition to the fine art for adults and art collectors, there is a Kids Village featuring huge inflatables, arts & crafts and face painting for all ages. Sponsor booths are located throughout the festival with everything from live radio remotes to great prizes and interactive games. No pet dogs are allowed at large outdoor events like the Atlanta Dogwood Festival, according to a City of Atlanta ordinance. Music has become an essential feature of the weekend’s festivities, and this year will be no different! A wide array of diverse musical offerings will fill the springtime air throughout the weekend! The full schedule of music and entertainment will be announced soon. And when you get hungry, follow the delicious smells of funnel cakes, gyros, crab cakes, onion rings, kettle corn and much, much more! Download the 2019 Program Guide! 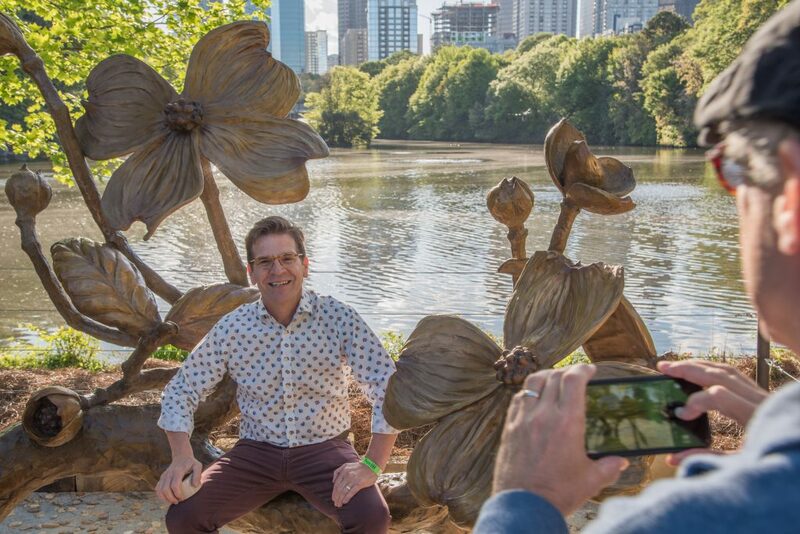 In recognition of its 80th anniversary, the Atlanta Dogwood Festival has commissioned an interactive bronze sculpture that will welcome guests to Piedmont Park for many decades to come. The sculpture, shaped as a giant dogwood limb with massive blooms, will also serve as a bench for park visitors. “We worked closely with Cherrylion Studios to create a beautiful piece of art that fit the feel, design and beauty of Piedmont Park while reminding people throughout the year of the festival’s commitment to bringing the finest art to the City each springtime,” said festival executive director Brian Hill. The Atlanta Dogwood Festival has worked with the Piedmont Park Conservancy and the City of Atlanta Department of Parks and Recreation to gain approval for the sculpture, which will be located near the Charles Allen entrance of the park. As the third-oldest fine arts festival in the country and the oldest event in Atlanta, Hill and festival board members saw the 80th anniversary as a special year and looked for a way to mark the milestone. Since Walter Rich’s intention when founding the festival in 1936 was to highlight the blooming of the dogwood trees, the design offers a fitting tribute. The Atlanta Dogwood Festival is currently running a capital campaign and seeking support from members of the residential and business communities to generate a fund for the sculpture’s installation and maintenance. Be a part of history by making a tax deductible donation to the commemorative sculpture fund today. 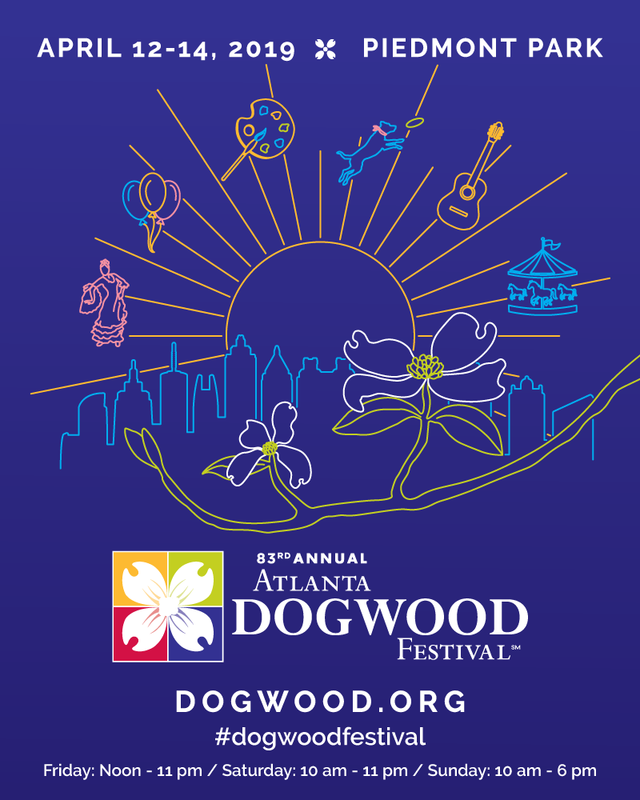 The Atlanta Dogwood Festival is a registered 501(c)3 organization.